“Football is a simple sport: 22 players run after a ball for 90 minutes, and in the end, the Germans win”. This line from English footballer Gary Lineker might be one of the more famous quotations in the history of the game, but it is nevertheless inaccurate. The truth of the matter is as follows. Football is a simple sport: 22 players run after a ball for 90 minutes and in the end, the country with the highest tax-to-GDP ratio wins. This is decidedly less catchy, but proven by the irrefutable law of the land. After Euro 2016, held in France, we had some fun looking at each team’s results and their respective nations’ taxation levels. The conclusion was that too much tax doesn’t harm a team’s chances. The truth is rather the contrary: the teams which did best in this tournament were those from the nations with the highest tax-to-GDP ratios – that is, the relationship between a country’s compulsory taxes, levies and social security contributions, and its Gross Domestic Product (GDP). We are therefore able to reveal that Denmark will be world champions on July 15th, after a closely fought final against France. Our methodology is simple enough: if two competing countries have tax-to-GDP ratios separated by more than five points, the country which taxes the most will emerge the victor. In cases where the difference is less than five points, we have decided to count the match as a tie in the group stage. In the knockout rounds, where the difference is still less than five points, we have substituted fiscal analysis with the (admittedly less than infallible) sporting expertise of the Alternatives Économiques editorial board. Thanks to its advantage of at least 5.15 points, Denmark ought to beat the French in this year’s World Cup final. The explanation? Again, simple enough: the countries with higher level of taxation are, generally speaking, the most developed. Thanks to public spending and quality social protection systems, the inhabitants of these countries are in good health and have sufficient free time to engage in sports. Furthermore, with a high level of public investment, football players in these countries have access to top quality equipment, expert supervision, structured clubs, and are often paid in part by their communities. Thus, the “Icelandic miracle”, which Iceland and its 320,000 inhabitants experienced when they qualified for the Euro 2016 quarter finals, and then qualified for their first ever World Cup, is not really a miracle at all. Icelandic football has seen significant development thanks to high quality sports equipment and well-trained coaches, as our colleagues at l’Equipe Explore have well documented. 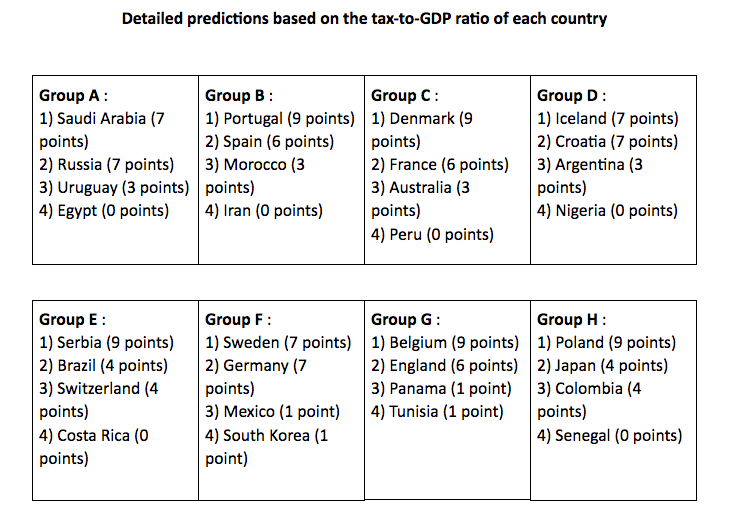 Now, the average tax-to-GDP ratio of the 32 World Cup teams is 33.5 percent. 7 of the 8 groups are close to this average. Only one group clearly stands out: France’s group C. This fiscal “group of death” comprises of Denmark (58.7 percent), France (53.5percent), Australia (34.09 percent) and Peru (22.4 percent). Of course, football is one of those sports where the incertitude of the result is greatest (the best competitors win less often than in other sports), and there will of course be turns of events that cause you to doubt our theory. But don’t fool yourself, the winner will be a fan of taxation. This correlation also reminds us that the talent of footballers (like other “stars”) is relative. It doesn’t come from nature alone, but is also the result of training and social construction. This doesn’t mean that talent can’t emerge from nowhere: countless players of modest origin prove the contrary. But the level of education, support and infrastructure provided for players and teams is decisive in the possibility of progressing to the highest level. This is something that the football world sometimes forgets when it complains about taxation levels… or refuses to contribute, like UEFA with regard to Euro 2016. A note to readers: while this article is (relatively) serious, the same cannot be said for the analysis of the final section!